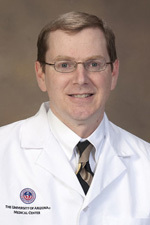 Dr. Sligh attended Washington University in St. Louis prior to beginning medical school at Baylor College of Medicine where he earned an MD degree as well as a Ph.D. in Human and Molecular Genetics. He is the current Division Chief of Dermatology at the University of Arizona and the Chief of Dermatology at the Southern Arizona VA Healthcare System. He is an Associate Professor in the Department of Medicine as well as the Associate Director of the Skin Cancer Institute at the Arizona Cancer Center.